Saratoga's Jacob Christopherson ran to a seventh-place finish in the boys varsity division at the Saratoga Invitational. Records are made to be broken. But this is getting ridiculous. Matt Bates and Michelle Beritzhoff of Los Gatos are each off to impressive starts in the 2000 cross-country season. How impressive? Well, in back-to-back weeks the Gatos runners have written their names in the record books at neighboring schools. Bates and Beritzhoff each set new course records on their way to victories at the Firebird Invitational at Fremont in Sunnyvale a couple of weeks back, and last Thursday the two were record-setters once again at the Saratoga Invitational. Bates snapped the old course mark of 9:54.8 set in 1999 by Girmay Guangul of Santa Clara by covering the 2.0-mile Saratoga course in 9:52. A week earlier, he had set a new mark of 9:38 on the 2.05-mile course at Fremont. 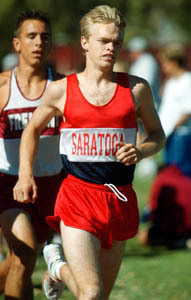 Beritzhoff ran 11:56.4 to tie the Saratoga course record set in 1998 by Saratoga great Anne Ricketts. Beritzhoff had broken Ricketts' Firebird record of 12:14 a week earlier by running 11:29. "She tied the course record, and she went off the course by at least eight seconds," said Los Gatos coach Willie Harmatz of the talented junior runner. "She is running fantastic." Beritzhoff was the easy winner in the race with teammates Lynsey Harris fourth in 12:56.7, Jen Rutnitz fifth in 13:00.9 and freshman Kristy Yackle eighth in 13:36.2. But since Los Gatos did not field a complete team, the Wildcats did not place in the team standings. Milpitas won the team title with Saratoga second and Lynbrook a close third. Dernie Wang finished 11th in 14:02.0 with Joanna Burgess 13th in 14:07.3 and Carol Liu 17th in 14:34.2. Joanna Chan ended up 21st in 14:38.7 with Laura Lin 22nd in 14:41.3. That was a good enough finish to help the Falcons edge the Vikings by a point in the team standings. Saratoga was second with 61 points and Lynbrook ended up second at 62. Sophomore Francine Lee finished in the top 10 for the Vikings, running ninth in 13:46.3. Freshman Sasoon Kim was 16th in 14:31.2 with Kate Bossange 18th in 14:35.7, Hyan Kim 19th in 14:37.0 and Evan Smith 24th in 15:02.6. Los Gatos easily won the boys varsity title at Saratoga with Bates first, Tomas Viramontes second, Jeff Hoeft sixth, Darren Key eighth and Greg Tolan ninth for 23 team points. Jacob Christopherson led Saratoga to a team second at the meet hosted by the Falcons. Christopherson finished seventh overall in 10:28.2. Don Prolo was 12th in 10:50.3 for the Falcons with Richard La 13th in 10:52.9. David La was 15th in 10:54.5 and Brett Stanger was 21st in 11:19.9. Lynbrook and Fremont finished fifth and sixth in the team standings. Jeff Whitsett led Lynbrook to a team fifth by running 18th overall in 10:57.1. Teammate Chris Deal was close behind in 20th in 11:14.1 with Ryan Deal 25th in 11:35.0, Eugene Berson 26th in 11:36.5 and Chad Smith 27th in 11:41.4. In the boys frosh-soph division, Santa Clara finished first with 58 points and Fremont was a close second at 63. Jacob Osborne ran strong for the Falcons. The sophomore was 12th overall in 12:12.8 with Steven Surrette 16th in 12:15.8. Morgan Katz of Lynbrook was 14th in 12:14.1 with Allen Chang 19th and Jason Whitsett 22nd. Matt Meyer was first in 11:53.9 to lead the Lynbrook boys to a junior varsity title at Saratoga. Ken Chung was fourth with Jonathan Choi fifth, Casey Courtney 12th and Chris Lum 13th. Saratoga's Ian Kolb was sixth in the JV race in 12:16.5 with Lee Blair eighth, Takashi Tomonaga ninth and Tony Yiu 11th. In the girls junior varsity division, Milpitas edged Saratoga by a point for the title with Lynbrook third and Fremont fourth. Stephanie Morrison was seventh in 15:03.8 to lead the Falcons to the second-place finish in the team standings. Judy Wang was ninth with Daphne Lo 10th, Priya Talrejo 12th, and Mary Elliott 14th. Jessica Ignatius finished in the top 10 for Lynbrook, nailing sixth in 14:58.6. Linda Hung was 15th with Jessica Gall 16th, Lynn Chen 27th and Amber Ju 30th.